Reading food labels can help you choose wisely when food shopping ― if you know what to look for. Food labels identify the food, the amount inside the package, ingredient list, nutrition information and nutrition facts. Standardized serving sizes enable you to make nutritional comparisons, which can help you choose more nutritious foods, determine which foods have lower calories and more dietary fiber content, maintain a healthy weight, and consume foods high in nutrients. Here's a simple step-by-step summary of the essential features. Start with the serving size and servings per container, both significant numbers. You could slip up with your portion sizes if you read this part wrong, as the information on the nutrition label is based on one serving, not the whole package. Next, check calories. Notice the calories per serving and how many calories you’d be eating if you consumed the entire container. Caloric needs vary according to every individual, but foods high in calories can add up quickly if eaten in excess. If you consume double the servings, you’re consuming double the calories and may eventually double in size! It’s best to choose foods naturally lower in calories to help maintain a healthy weight. Limit total fat, cholesterol, and sodium. These nutrients are the ones people mostly eat enough or too much of. According to labeling laws1, 3 grams or less of Total Fat per serving is considered a low-fat food, 5 grams per serving is moderate fat, and 8 grams per serving is identified as high fat. Eating too much trans fat, cholesterol, or sodium can raise your risk of various chronic diseases, such as high blood pressure, heart disease, and some cancers. Choose more foods that are lower in fat, and eat high-fat foods in moderation. Labeling laws require that foods with a low-cholesterol label have less than 20 milligrams of cholesterol or 2 grams or less of saturated fat per serving1. Cholesterol-free means that the food must contain fewer than 2 milligrams of cholesterol and 2 grams or less of saturated fat per serving. A food claiming to be low in cholesterol or cholesterol-free does not mean it is fat-free. Although vegetable oils contain no cholesterol, they are 100% fat. American Heart Association’s general recommendation for salt is 2,300 milligrams of sodium per day2. That number may be less for those with heart disease and other chronic diseases. Labeling laws identify a low-sodium food as less than 140 milligrams of sodium per serving1. Get enough of total carbohydrates and protein. The best way to get enough carbs is to eat fruits, vegetables, and whole grains. According to the Dietary Guidelines for Americans3, women need 25 grams of fiber per day, and men need 38 grams per day. The average daily dietary fiber intake is 16 grams per day. Look for products that have at least 3 grams of fiber or more per serving. The American Heart Association recommends limiting daily sugar intake to: 36 grams for men, 25 grams for women4, 25 grams for toddlers and teens, and zero for children under the age of 2. A teaspoon of sugar is 4 grams of sugar. On packaged products, aim for around 5 grams of sugar per serving. Avoid heavily processed sugars such as high-fructose corn syrup and artificial sweeteners. Better sugar alternatives are coconut sugar, coconut nectar, maple syrup, and molasses. Protein helps curb hunger, maintain a healthy weight, and build muscle. The recommended dietary allowance for protein is 0.36 grams per pound6, which is approximately 54 grams of protein for a 150-pound person. Aim for 0.68 grams per pound if you’re exercising regularly. For healthy protein, eat moderate portions of beans and peas, nut butters, seeds and soy products. The footnote. Not found on all nutrition labels, the footnote gives a table listing the total daily grams of fat, cholesterol, sodium, carbohydrates, and fiber that the USDA recommends in a 2,000- or 2,500-calorie diet. The % Daily Values. These are based on a 2,000 calorie diet. You may have dietary requirements that are higher or lower than these amounts depending on your gender, age, and activity level, so it’s a good idea to check with a registered dietitian to find out how much you should be eating. All ingredients in a food product must be listed on the label in order, from largest to smallest by weight. If you identify that the first few ingredients are clean and minimally processed ingredients, you can feel good knowing those ingredients make up most of the food. The opposite is also true. If things such as refined flour or sugar are at the top of the list, then the bulk of what you’re eating is, well, refined flour and sugar. Choose foods with fewer artificial ingredients and preservatives. At Down to Earth, we believe the highest quality natural foods, supplements and body-care products should be all-vegetarian, free of artificial flavors, colors and preservatives, and minimally processed. For example, we provide supplements that have no artificial binders or fillers, are made from natural ingredients, and contain no synthetic chemicals. When it comes to ingredient labels, a simple rule of thumb is that, if you can’t pronounce it or have only seen it in chemistry class, don’t eat it! The fewer ingredients, the better! 1 U.S. Food and Drug Administration / Center for Food Safety and Applied Nutrition. (2013). 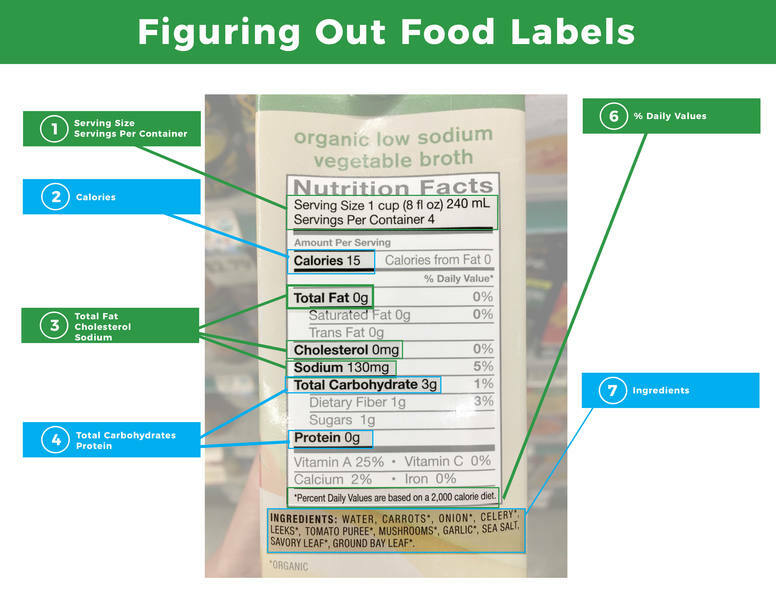 A Food Labeling Guide: Guidance for Industry. College Park, MD: Author. 2 American Heart Association. (2017). Why Should I Limit Sodium? Dallas, TX: Author. 3 U.S. Department of Health and Human Services / U.S. Department of Agriculture. (2015). 2015-2020 Dietary Guidelines for Americans. 8th Edition. Washington, DC: Author.